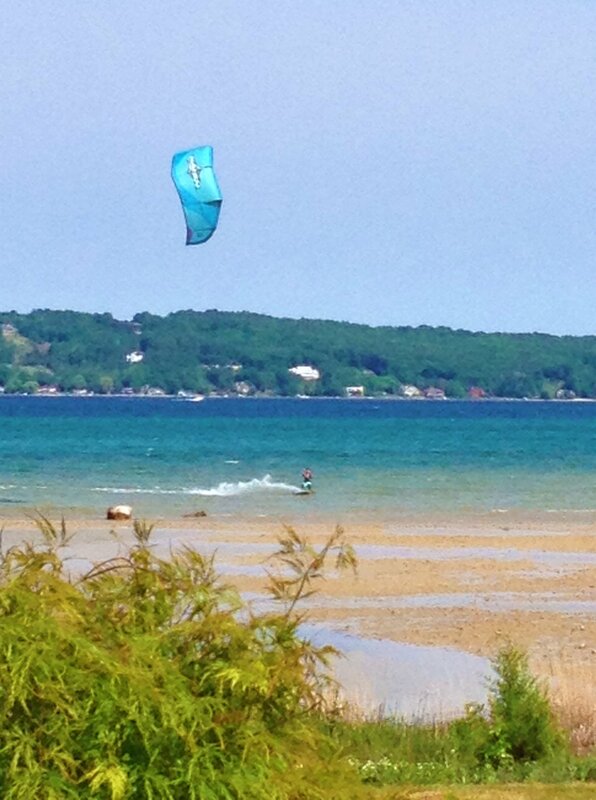 My wife found some lost kiteboarding footage from last summer in West Bay, Traverse City. There’s not a lot of kiteboarding action but you can see how beautiful it is up there so I thought I’d post it. We were visiting at my parent’s friend’s house and I brought my gear with us just in case the wind was right but I really didn’t expect to get out. Beautiful warm blue water made for a great session. Traverse City offers some of the nicest scenery in all of Michigan. The Old Mission Peninsula is between East and West Bay and offers spectacular views of the area. There are many wineries along the bay in addition to artisan bakeries, and boutiques. My parent’s friend’s house is located on the west side of West Bay. Not exactly the ideal location for kiteboarding when winds in the area typically have a westerly flow making them off shore. I lucked out though and there was a warm south east wind that day.There’s not much beach so I rigged up my gear in the bay and used a kite anchor (this is where I bought mine, just sharing the link) to safely launch by myself. I should note that on the west side it is very shallow but also very mucky and rocky until you are a couple hundred yards away from shore. Anyway I rigged up as the wind was starting to come alive and by the time I launched it was blowing a good 15-20 knots. The bay was extremely warm that day and the wind was steady. I started riding out towards the bay and heard my board scrape against the rocks as I went through a shallow spot. It’s amazing how far out the shallow goes out on the bay. There is a definite drop off a few hundred yards from shore but even then the water didn’t look extremely deep. As I got out toward the drop off the waves had a little more chop to them but it was still much flatter than I’m used to when riding on Lake Michigan.